Configure and use any type of gamepad or joystick in Skyrim without the need of an Xbox 360 controller emulator while still retaining mouse and keyboard controls. If you have a gamepad or joystick which isn't a real Xbox 360 controller then in order to use it with Skyrim you would either have to use an Xbox 360 controller emulator or use some form of third party software that maps the gamepad controls to keyboard and mouse controls. Using an Xbox 360 controller emulator will force Skyrim into a gamepad focused mode which can be rather annoying when you also like playing with a mouse and keyboard in addition to using a gamepad. Using third party software can also be rather annoying and if you buy a cheap generic gamepad then the manufacturer doesn't have their own software which makes you have to search for alternatives. 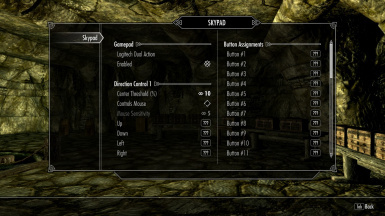 This mod allows you to use any type of gamepad or joystick and map the controls to mouse and keyboard controls through an MCM menu in Skyrim. This makes it easy to play around with settings and see the results immediately in the game to fine tune how you play. You can retain a mouse and keyboard focused mode to the user interface unlike when an Xbox 360 controller is connected. The goal of this mod is to allow any kind of game controller to work in Skyrim very easily. I personally use a Logitech Dual Action gamepad which has a pretty typical layout, but if you want to do something crazy like use a flight stick or even a steering wheel for racing games you can do that with this mod. If you have a controller with lots of buttons this is capable of mapping up to 32 buttons in Skyrim. I will do my best to make this work as much as possible for any game controller, but I won't be making any changes that are specific to a single game controller. For example what I label "Direction Control 2" can be used as rudder and throttle controls on a flight stick, but on a more generic gamepad it may just be the second analog stick control and trying to figure out what name to display would just be too complicated so I stick with generic naming for everything.